DUT boards for the Trillium tester are usually single disks about one foot in diameter. 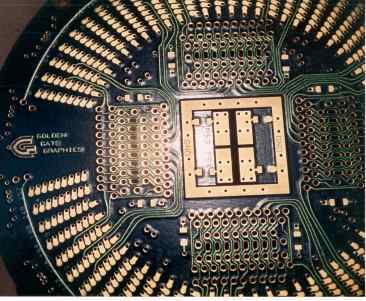 The Device Under Test board system shown here consists of a ring or halo-shaped motherboard and a disk- shaped daughter card. This system was developed for Trillium testers by ESH Inc., who designed and built the halo board shown here. This system allowed for the package-specific portion of the tester board to be a small daughter card. The signal related probe points of the tester touched, skidded a tiny distance across, and bonded to the bottom of the daughter card. The power supplies were brought in through the halo card. A bracket fitted the daughter card to the halo card mechanically, and also electrically, conducting the power supplies through edge contacts. Please note: Terms used in the expanded photographs are defined in our Glossary. The boards shown in the picture are very thick for mechanical rigidity (0.13" thick). The daughter cards are 5.58 inches in diameter. The halo board is essentially the same for every package tested, but with various jumper wire configurations depending on the power supplies used. The daughter cards are specific to the package being tested, but are much smaller than the overall DUT board assembly. Five daughter cards can fit on a printed board panel, whereas only one foot-wide disk would fit on a panel. Thus, this system greatly reduced the cost of DUT boards for the chip manufacturer's testing facility. DUT boards are designed for the controlled impedance of the tester being used. Trace corners are rounded to reduce noise. The surfaces that the test-head probe points connect to are bondable, just as are the bonding pads inside a chip carrier package. This is why the metallic surfaces of a DUT board are golden. The bondable surface is flash gold (also called electroless gold) over nickel. Golden Gate Graphics designed over a dozen of these daughter cards, of which the chip manufacturer had hundreds built. A major supplier of zero insertion-force (ZIF) sockets for large fine-pitch chip carriers is Yamaichi. Much of the time spent designing one of these DUT boards was in "building" the thru-hole socket footprint. Located in the middle, near Littleton, Highlands Ranch and Englewood, of the Rocky Mountain Front Range High Tech Corridor, which includes the following cities from south to north: Colorado Springs, Monument, Castle Rock, Littleton, Denver, Boulder, Niwot, Longmont, Loveland, Ft. Collins and Greeley.